Most tee shirt quilt makers 'don't do borders'.. Hmmm, why is that? Laziness? Cheap? Inexperience? A border is a strip of fabric that frames the quilt. The entire quilt top is usually has one or more strips of coordinating fabric surrounding the entire group of t-shirts. 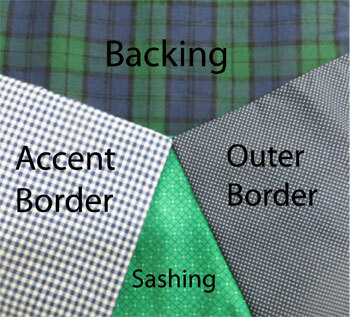 Sashing is the 'border' around each t-shirt. (see Sashing on a T-Shirt Quilt ). Note in the picture to the right, the labels showing different parts of the quilt. T-Shirts are made from a 'knit' fabric, which is by nature is - "stretchy". That is why you like to wear them. They stretch in several directions and fit comfortably. Folks that sew tshirt fabric directly to another tshirt fabric are probably stretching the two pieces of wayward fabrics in opposite directions trying to make them match up. What might have been cut as a 4.5 inch square is probably closer to 5 inches once they have sewn it because they have not used a stabilizer. There are several kinds of stabilizer materials. There is Pellon [brand] and others that are a man-made polyester film that can be ironed to the back of your tee. What that does is make a 'STIFF' block. That is the stuff that gives stabilizers a bad name. What we use is a 100% COTTON stabilizer that adds just enough sizing to the shirt that keeps it from stretching when sewing the fabrics; either to another tee, or to a sashing - again (see Sashing on a T-Shirt Quilt ). Note: The Lucy Laney block is stabilized with PELLON brand (stiff stuff). What we use is applied to the back of the red block. Notice how it 'drapes'? Stabilizers are used to control the stretch. We add stabilizer to the backside of a tshirt which puts the tshirt square into OUR control. Sashings and borders are more steps in giving you a SQUARE quilt. OK, we are not talking about a quilt that is the same size on all four sides. What we ARE talking about is a quilt that hangs straight, and is the same width at the top and bottom of the quilt. The other thing that those folks that DON"T use stabilizer don't tell you, is that they can't use ANYTHING THAT CAN BE LAUNDERED CAN BE USED. Oh, did I YELL that? Our motto is that if it can be laundered, we can use it. Those OTHER companies, can't use many of your items of clothing, because they are stabilized. The other thing that "professional" quilters know is that mixing 100% cotton and polyester or poly-cotton blends don't play well together. When trying to quilt those layers together, you inevitably end up with puckered quilting. Not a professional looking outcome. We Are The BORDER Kings. So, why do we add borders to ALL of our quilts? Have you looked at the photo gallery? That pretty much answers that question....(ahem) We are professional quilters. We make QUILTS, not blankets. ( see Difference Between a Quilt and Blanket) We are also very traditional (read more at Quilts - Order or Chaos?). can be any color, or combination of colors. The borders on a quilt can be wide or narrow. Borders generally set the 'tone' of the quilt. That means do you want a 'blue' quilt or a 'red' quilt? In the example to the left, the customer wanted to match school colors, which were navy, black and silver, with a flannel back. Probably 95% of the quilts my grandmother and two great-grandmothers made ALL had borders. The exceptions were quilts like "Grandmothers Flower Garden" and "Double Wedding Ring" which tradtionally do not have borders, because they don't need them for the design of the quilt to be complete. We can add up to 3 borders on each quilt. Be sure to check our Pricing table to see different styles and options. 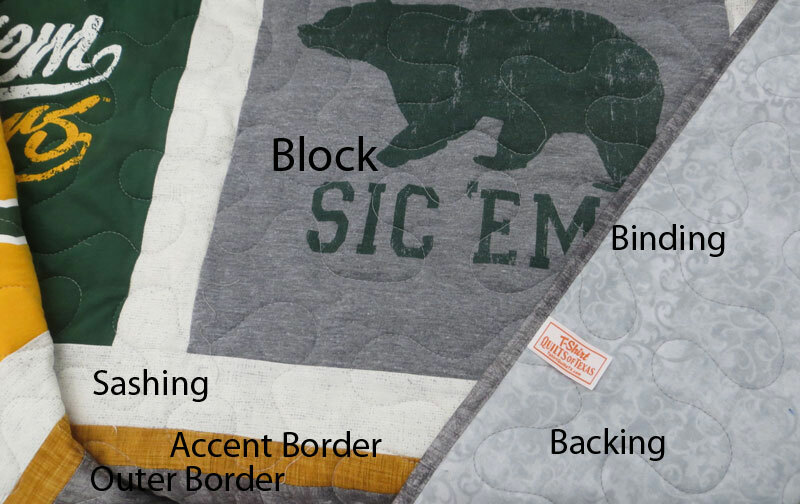 For more terms used in making a tshirt quilt, check out this post: T-Shirt Quilt Terms Acronyms. 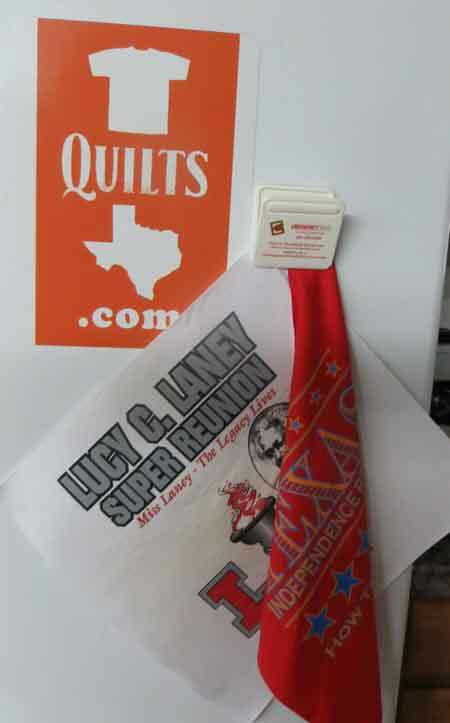 If you are ready to get started with your t-shirt quilt, just click to get the next steps.